If I were president I would keep that bunny creepily wandering around the White House all year round, just to keep people on their toes. Although we can probably add that to the ever growing list of reasons I will never be president, right next to "Annexation of Northern Virginia" and "Forced secession of any state that names a park after a klan leader". 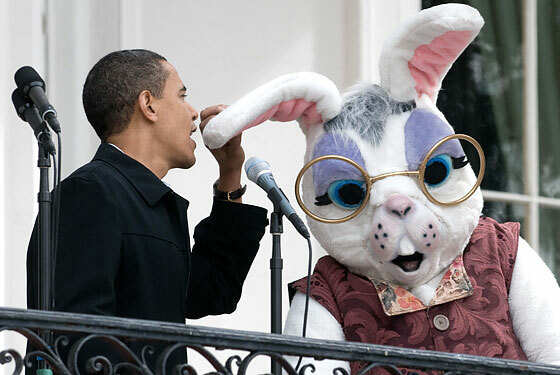 Oh yeah, and if anybody can find an image of the entire bunny, we're having a Harvey inspired photoshop contest for "funniest picture after adding a strange human-sized rabbit".